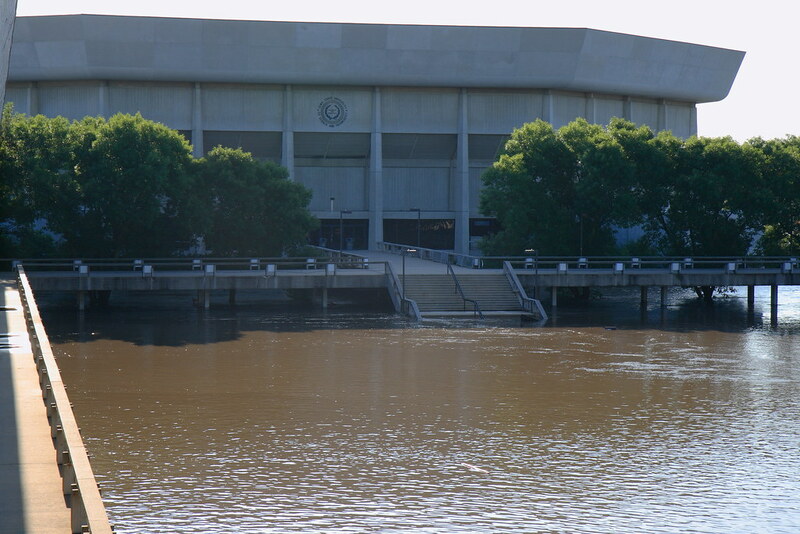 This non-descript concrete building surrounded by flood waters is actually the Hilton Coliseum in Ames, Iowa. It's where the Iowa State Hawkeyes basketball team plays but today it sits surrounded by murky flood waters after heavy rains - as much as five inches on already saturated ground - pounded much of Iowa last night leading to the closure of U.S. Highway 30 as well as Interstate 35 from Ames to Des Moines by the Iowa DOT. See more of Sarah Cady's Ames Flood photos here. Additional Ames, IA flood photos can be seen here. Nondescript? This is one of the most famous buildings in Iowa and you misspelled nondescript? This is Hilton Coliseum in Ames Iowa. Home of the Iowa State Cyclones. Cyclones not Hawkeyes! Sara, research your facts and use spell check. Famous building my arse. The Vet is a famous building. Hilton is where Tim Floyd used to coach. Big diff.